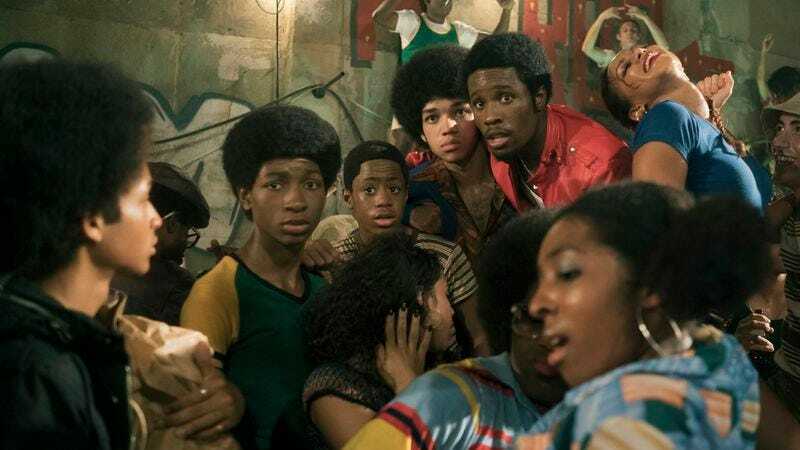 Because it doesn’t have a musical sequence as stunning as any of the episodes that came before it, “Forget Safety, Be Notorious” is easily the most boring episode of The Get Down so far. The most exhilarating instances of song-craft are Kool Herc’s set and Jackie trying to plunk out a new disco hit for Mylene. But the former is only fleetingly experienced by Ezekiel and the gang, and the latter is still very much a work in progress, even by the time the credits roll. Neither subplot has the knockout quality of the New York blackout montage or Flash’s DJ lesson, nor are they meant to. The conclusion of Jackie’s storyline—where the girls have to revive him from a cocaine overdose and haul him over to Papa Fuerte—actually ends up being more depressing than anything. Unfortunately, it is an accurate portrayal of the love/hate/addictive nature of many musicians’ creative process. But what the episode lacks in spectacle it just barely makes up for in narrative. For the first time in the series—now past its halfway point for this initial batch of episodes—we start to see how the outlying political/city-planning storylines connect to the music. Some of the details are small, such as how the looting during the power outage led to more young people getting their own DJ equipment. And that of course leads to more and more crews being formed. Suddenly, The Fantastic Four Plus One (a collective still in its infancy, it’s worth noting) conquering the world doesn’t feel as effortless. The boys will have to work that much harder to stand out amongst their even less experienced peers. Other threads result in more immediate consequences for the show’s central story. Papa Fuerte’s slickness still clashes with the more grounded performances of the younger cast, and that’s even truer of his rival-turned-ally Ed Koch (Frank Wood). And yet, their alliance feels important because of the significant impact it will have on the Bronx at large, especially in Koch’s crusade against graffiti. It’s no coincidence that their plans start to take shape in the same episode where Dizzee finds kinship in another graffiti artist. Politics also present the central conflict for Ezekiel, who feels torn by his buttoned-up internship at Fuerte’s office and joining his friends in hunting down the bootlegger who’s been distributing the Grandmaster Flash tapes. Justice Smith continues to find new levels to Zeke’s inner struggle, and Jimmy Smits’ character is finally playing a role in fostering that moral dilemma. As different communities in the city continue to fight over Ezekiel’s soul and future, it will be useful to have mentor figures (Flash, Shaolin, Fuerte, and maybe even his teacher, Ms. Green) standing tall in each of his disparate worlds. So even if the political business remains at odds with The Get Down’s tone, it’s at least starting to sync up with its story. It’s at least beginning to justify its presence. And with Kool Herc finally interacting with the Fantastic Four and Jackie (hopefully) on the cusp of a breakthrough with his new song, maybe the next episode will bring some of those killer music sequences back into the fold, too. No Cadillac or Fat Annie this episode! Unless I just blocked them out of my mind. Despite my above complaint about the general lameness of Papa Fuerte and Koch’s scene, the real-life Koch did have a somewhat over-the-top demeanor, exaggerated even more so by the show. It’s still somewhat intriguing to see Daveed Diggs rap in Nas’ voice, but the raps themselves are starting to feel more redundant than ever—nothing more than a creative spin to the “Previously, On…” bumper of any other TV show. They work best when hinting at what’s to come rather than what’s already happened. Does anyone else think that the extra standing next to Ed Koch in his first speech scene looks like Matt Damon? Ed Koch sounds like he’s a disciple of Oscar Newman’s defensible space theory from Show Me A Hero (and real life). ‘70s Stevie Wonder is my favorite era of Stevie Wonder, and it’s always great to hear “Living For The City,” however brief. Likewise, I’ve always preferred the ‘70s “Psychedelic Soul” period of The Temptations to their earlier stuff. It’s like the Motown equivalent to The Beach Boys’ output at that time. Last episode, we got “Papa Was A Rollin’ Stone” and in this one, we get “Ball Of Confusion.” Keep ‘em coming. Because the teaser image on Netflix for this episode is a prominent still of Dizzee, I kept thinking something bad was going to happen to him on this episode. But instead, he found a fellow friend and artist (and romantic interest, perhaps?) on the train.